A new study published in the Journal of Biology describes how a protein that promotes cell growth allows cells to metastasise and spread through the bloodstream. 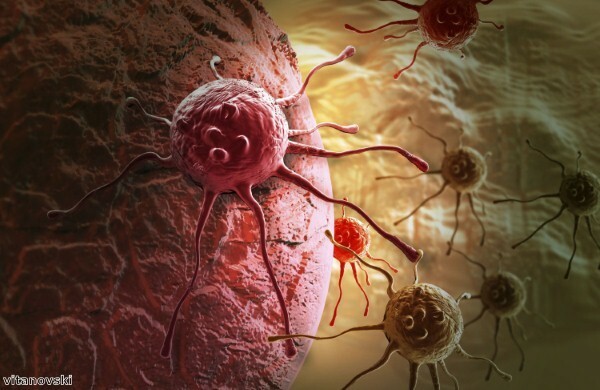 Cancer cells are confined to the tissue in which they arise unless they can find a way into the bloodstream. The growth factor VEGF enables cells to do this by loosening connections between endothelial cells that form the lining of blood vessel walls. VEGF triggers the phosphorylation of a protein called VEC, which serves to fasten endothelial cells together. As a result of this process, complexes that contain VEC fall apart, opening gaps between endothelial cells. Focal adhesion kinase (FAK), which accumulates at cell-to-cell junctions in the presence of VEGF, may play a role in VEC phosphorylation. Scientists from the UC San Diego Moores Cancer Center gave a FAK inhibitor to a group of mice with fast-spreading breast cancer and a group with ovarian tumors in an attempt to pinpoint the function of the protein. It was discovered that the inhibitor prevented phosphorylation of a specific amino acid, known as tyrosine 658, in VEC from tumor-associated blood vessels. VEGF was injected into a group of control mice and into mice with an inactive variant of FAK in their endothelial cells. Phosphorylation of VEC's tyrosine 658 occurred in the control rodents but not in the animals expressing inactive FAK, suggesting FAK controls the event. Research was then conducted to determine the effect of FAK on endothelial cell layers. VEGF-releasing tumor cells slipped through endothelial cells in experiments conducted on cell cultures. When endothelial cells produced an inactive version of FAK, however, cells did not pass through. Further experiments conducted on mice revealed animals that expressed inactive FAK in their endothelial cells developed fewer tumours in their lungs compared with a group of control mice. Metastasis was curbed but tumour growth was unaffected. The results show how endothelial FAK plays a role in controlling metastasis. They suggests it helps VEGF-expressing cancer cells open endothelial cell layers and clinical trials on FAK inhibitors are now being conducted.